This post sets out how Feroz and I tried to book a trip for a very short amount of time using as little money as possible. Look out for some live-progress tweets on Saturday the 7th of May for how we are getting on. I have always enjoyed travelling. That is, more than just travelling to visit somewhere, but the act of travelling itself. In about a weeks time I am set to find out whether this is really true or not. I’ve booked a return flight from London to Copenhagen with my friend Feroz. The return flight is 8 hours after our departing flight lands. Nyhavn Waterfront from the last time I was in Copenhagen. It was a rainy day. I had originally thought about travelling to a foreign country for a single day after booking a ‘normal’ holiday to Copenhagen earlier in the year. The flights, if booked at an optimal time, were cheap. I mean really cheap. We are talking less than £10 to get you there. I had thought that £20 for a flight abroad and back sounded like a great day out. Of course factoring in some necessities, such as getting to and from any of the airports near me, soon pushed my estimate up to £50 all in. That was still assuming I could get the super-bargain £9.99 flights. I mentioned this whole idea to my friend Feroz who agreed it was interesting enough to go ahead and try at least once. I planned to write at least a couple of blog articles about the trip, this being the first, then a second one after the adventure. If it proves to be a moderate success then we’ll make it some sort of ongoing escapade. There is also a loose plan to video the trip and make a short film about the whole journey there and back. I expect that even if it is uneventful we’ll get a good story to tell and a better-than-average day out. Arguably the biggest challenge in doing a cheap day trip abroad is booking the flights. After all this is the key to the whole challenge. It is the bulk of the cost and also dictates the logistics for the whole day. I’ve read that the best time to book flights is 53 days in advance. Using the trusty technique of trial and error, merged with weekends we were both available, we ended up booking about 90 days in advance. We settled on flying from Luton airport. Now is probably a good time to mention that neither Feroz nor I live anywhere near Luton airport. Google Maps tells me it is around 120 miles away, with an expected journey time of 1 hour 52 minutes (assuming, optimistically, a completely traffic free journey). Not ideal, but it had been carefully considered. Our nearest airport is actually Bristol. Whilst Bristol Airport does have flights to Copenhagen they are just not at suitable times for a day trip, thus we had to start looking further afield. Ryanair fly from Luton to Copenhagen, are a super-budget airline carrier and they fly this route multiple times a day, making them ideal for our little day project. With a route and airports picked, we booked. This was the first expenditure of the trip and we immediately spent more than I originally had in mind. Return flights cost us £48 each, I was originally hoping for something in the £20 to £30 range. Our outgoing flight was only £9.99, but there was only one suitable flight back that night, and it cost a whopping £37.99! After 5 minutes of scouring the internet the cheapest airport parking I could find for 24 hours at Luton airport was £10.19. I estimated that it would cost us about £25 worth of fuel to drive to and from the airport (based on a semi-optimistic 10p a mile in my old diesel car). At around £17.50 each this seemed reasonable enough. The only downside here is that transfers to and from the cheap airport car park take a while. Beyond minimising cost, minimising the non-exciting parts of travelling to Copenhagen is next on the list. I think the bus transfer from the car park to the airport terminal is the part I am least excited about. The alternatives were all non-starters. There isn’t an easy train journey from Bath/Bristol area to Luton Airport. We would have needed to catch the train into London then catch a coach. This would have given a journey time of 3 hours just to get to the airport, not to mention that it was considerably more expensive. If you’re planning a trip like this for more than one person and already own a car then driving to the airport can make a lot of sense for keeping the cost down. This is much easier than the UK side of things. I found from my previous visit that getting the train or metro is a really easy way to get from Copenhagen Airport to the city centre. There is a city pass you can buy that covers zones 1 to 4 of the metro. This is enough zones to get around the main parts of the city including the airport. Once we land there are several places to buy tickets as we leave the airport so it should be a smooth process. 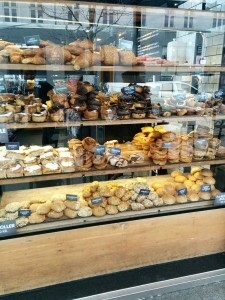 Likely part of the plan will involve buying lots of coffee and pastries. What do we plan to do when we get to Copenhagen? Good question! Probably walk a lot. With limited funds I expect the main bulk of time will be taken up with exploring the city outdoors, general walking, capturing photos/videos and drinking coffee. As for more specific ideas, the Rundetaarn (Round Tower) in Copenhagen gives a good view over the city and is only 25DKK (about £2.50) to go up. 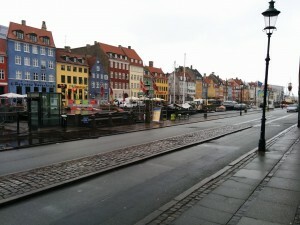 Wondering around the Nyhavn waterfront, or up to The Little Mermaid are also interesting (and free!) things to do. The only potential issue is if the weather is poor, but the current forecast is for a partly cloudy day with highs of 17°C — sounds perfect for city exploration. The total spend for the trip so far is around £73, that’s flights, fuel, parking and a city pass to get around on Copenhagen’s metro. That just leaves food and drink, which I’m budgeting £27 for with the aim of doing the whole trip for less than £100. There is definitely scope for future sub-£100 day trips to other countries. The Ryanair website shows plenty of other flights that are in the £10 to £50 range. It also shows how the price of the flight changes depending on which day you choose, which came in really useful. Skyscanner also has a useful ‘search everywhere’ option if the main aim is just to fly cheaply rather than to a specific place. Next weekend should be interesting. We plan to tweet about the journey as we go, so there should be plenty of activity over at @falkus_salam (it looks a little blank at the moment!) and @mfalkus accounts.